Following their free concert performance streamed on YouTube this past Sunday, Irish rockers U2 (guitar tab) will now play a free concert in Berlin to help the city celebrate 20 years since the fall of the Berlin Wall. Not surprisingly, the show sold out immediately. According to the band's web site, they will perform in front of the Brandenburg Gate on November 5, as part of the 16th MTV Europe Music Awards, and that performance will be beamed by satellite into Berlin's O2 World arena, where the awards ceremony will be held that night. The Berlin wall fell November 9, 1989, ending almost 30 years of separation between east and west. "On July 7th of this year we were honored to perform at Arenes de Nimes, the historic Roman amphitheatre in Nimes, France, easily one of the most spectacular venues in the world. We thought it would be a memorable night, so we asked our friends in France to bring along a film crew to document the festivities. The result is "Francais Pour Une Nuit" (translation: "French For One Night"), the DVD of the evening including the full show, interviews with us, and five videos shot by YOU, our buddies in the audience. All this and more will be available starting November 23, 2009!" The DVD will be available in retail stores in France only, at www.metallica.com, or you may order online through the record company at www.metallicanimes.com. There will be three formats available: Standard DVD (in a digipack including a 16 page booklet), Blu-Ray DVD (also in a digipack with the booklet), and the deluxe limited edition box set (it's actually a tin) that includes the DVD, a copy of Death Magnetic on CD, a large t-shirt, laminated pass, and five exclusive photos. Download official Metallica guitar tab here! Unless you've been living under a rock, you've seen countless clips of Michael Jackson's "This Is It" tour rehearsals on any number of cable and network news and entertainment shows. And in many of those clips, you've seen a young, blonde female guitarist performing with the King of Pop. Her name, if you haven't heard by now, is Orianthi, and her debut album, Believe, hit shelves this week. Although the 24-year old PRS-wielding Aussie lass had opened for her hero Steve Vai (guitar tab) and traded licks with legendary guitarist Carlos Santana (guitar tab), it was Orianthi's scorching solo while backing country superstar Carrie Underwood on last February's Grammy Awards show that prompted Jackson to offer her the gig for his 50-show run at London's O2 Arena. Sadly, Jackson died June 25, 2009, just weeks before the tour was to begin. Fortunately for fans terrifying guitar chops, Orianthi had already been busy writing and recording Believe, which features some seriously shred-tastic pop music—and an eye-opening instrumental with Steve Vai titled "Highly Strung." In the October 16 edition of Entertainment Weekly, Orianthi says of the album: "It has an '80s vibe. I play a solo on every song, so I'm hoping I can inspire people to play guitar—especially young girls." You can get a good taste of Believe by downloading the lead single, "According to You," which iTunes is offering free for this week only, here. Or visit her official web site, Orianthi.com. Meanwhile, check out a couple of mini-lessons from Orianthi, below. Let's face it: not all guitarists can make it in the music industry as artists or session players. In fact, for most of us, no matter how big our ambitions, it will become a lifelong hobby. But hobbies don't pay the bills, and if you've got your heart set on working in the music industry, there are other alternatives, such as writing for guitar magazines and guitar blogs, or working at a label. But it's no cakewalk. If this is something you're interested in pursuing as the ubiquitous "backup plan," this new book McCarren Publishing, Do the Devil's Work for Him: How to Make It in the Music Industry (And Stay in It), is a must-read. 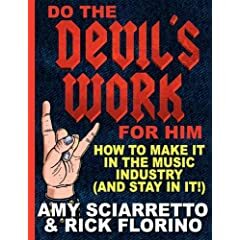 Written by noted music and entertainment writers Amy Sciarretto and Rick Florino, the book is a "she-said, he-said" pocket guide on how to get your foot in the door of the cutthroat entertainment business, offering tips on how to intern, how to network, and how to adjust to the ever-changing climate of this "eats its young" industry. Amy Sciarretto is a 15-year veteran of the music business, having written extensively for Kerrang!, Revolver, TeenPeople.com, Spin.com, AOL Noisecreep and Spinner, Urban Ink, Rebel Ink, Guitar World, VH1.com, and ARTISTdirect.com, to name a few, and having served as Loud Rock Editor for CMJ New Music Report and Hit Parader. She worked as a DJ on Sirius/XM for two years and has also worked in the promotion and publicity departments of top independent label Roadrunner Records for 8 years. Rick Florino founded Ruin magazine in 2006, and he's currently entertainment editor for LAX magazine and an editor for ARTISTdirect.com. His writing has appeared in publications and web sites such as Inked, Revolver, BPM, Hit Parader, Shockhound.com, Citysearch.com and other outlets. This year, Florino also released his first novel - DOLOR: Lila. In addition to two humorous, clever, and insightful author perspectives, as well as advice, anecdotes, and analysis, the book also features a complete extra chapter of advice from top-tier music and entertainment business personnel and rock stars, including members of multi-platinum acts like System of a Down, Guns N' Roses, and Korn. For more info, please visit McCarren Publishing here. This Wednesday, every single fan who buys a ticket to a Live Nation club show is automatically entered to win an Ultimate Access Pass to the venue for which they bought their ticket. The Ultimate Access Pass is Live Nation's golden ticket, good for admission to every single show in 2010 to an individual Live Nation venue. Every Live Nation club venue will have an Ultimate Access winner, with the names of winners posted on LiveNation.com, Thursday at 12 noon (EST). Additionally, on Ultimate Access Wednesday, every single ticket will be available at reduced cost as Live Nation drops the service fee on hundreds of thousands of tickets in its club venues across the country for one day only. In addition to offering the concert goers the chance to win the Ultimate Access Pass, Live Nation is bringing music fans and their favorite bands closer together by hosting fan-and-band meet and greets at venues across the country. Bands including Anvil, Between The Buried And Me, Dethklok and Mastodon, Hellogoodbye, Hollywood Undead with Atreyu and Escape The Fate, LMFAO with Shwayze, Taking Back Sunday, Tesla, and The Used will spend the afternoon meeting fans, taking pictures, and answering questions. The box offices at Live Nation clubs will be open on Wednesday afternoon, selling no service fee tickets to all scheduled events. All fans purchasing tickets at the box office on Wednesday will also be entered to win the Ultimate Access Pass for that club. In addition to the onsite meet and greets, the No Service Fee offer will also be available at www.livenation.com for 24 hours beginning at 12:01 a.m. local time on Wednesday, October 28, on participating shows. "I just want to say that Hollywood Undead is totally stoked to have this chance to give back to all of our fans across the Nation on this tour," said Hollywood Undead's Charlie Scene. "It's really cool to see everybody working together for the greater good of music and live shows." Lawn, general admission or reserved tickets subject to available at participating venues and select shows. Parking and shipping fees may apply. Cannot be combined with any other offer or discounts. Ultimate Access Pass good at one of participating venues only. Not available in Canada. No purchase necessary. For complete details and official rules go to livenation.com. Megadeth frontman Dave Mustaine has today (10/22) launched his own "Artist Personal Experience" (A.P.E.) online radio station, "Megadeth Radio." The singer/guitarist has complete creative control in the programming of the 24-hour channel, which features interviews, news, personal commentary, and playlists of his favorite music. Megadeth follows hot on the heels of A.P.E. stations "Radio Weezer," "Christina Aguilera Radio," and "Eagles Radio Hosted by Joe Walsh." "Megadeth has been on the forefront of music for over 25 years," says Mustaine. "Now we're breaking ground in radio. We're giving metalheads everywhere a look inside and an opportunity to see what influences our world and music." In addition to Megadeth tunes, listeners can expect to hear playlists including the music of AC/DC, Arch Enemy, Black Sabbath, Suicidal Tendencies, Killswitch Engage, and more. Interviews and eclectic stories told by the band members will punctuate the programming, including Mustaine talking about his younger days (and trading pot to a record store clerk for albums), Metallica, his writing process and more. "Megadeth Radio" will be distributed across Clear Channel Radio's "iheartradio" network, which includes hundreds of local radio websites; the popular iheartradio mobile app, which has been downloaded by 3.5 million people; widgets; and Megadeth.com. Fans can participate in "Megadeth Radio" by emailing their comments to megadeth@aperadio.com or calling 1-866-686-1010. Megadeth (guitar tab) released their latest studio album, Endgame—featuring killer new guitarist Chris Broderick—on September 15, 2009. Megadeth and Slayer will head up north to co-headline the Canadian Carnage Tour from November 8-13, featuring Machine Head and Suicide Silence. Megadeth will then return to the U.S. to headline their Endgame Tour through the end of the year. Full tour dates and info can be found here. Santa Barbara, CA –Seymour Duncan announces the release of the latest addition to our popular Blackouts Humbucker series: the Blackouts AHB-3 Thomson EMTY. Mick Thomson from Slipknot asked for tighter bottom, and more searing top end cut, and Seymour Duncan delivered with the EMTY, a pulverizing new edition to our Blackouts line. Mick depends on EMTY to execute his completely psychosocial tone that defines the Slipknot (guitar tab) sound; because to play extreme metal, you need extreme tone. To celebrate this new release, Seymour Duncan is giving fans the chance to win Mick Thomson’s signature Ibanez MTM1 with Mick’s new signature Seymour Duncan Blackouts EMTY installed. Ten second place winners will receive signed sets of EMTY pickups and a host of third place winners get Slipknot or Seymour Duncan swag. To win, contestants need to click here and enter into the drawing. The contest runs to midnight January 31, 2010. Mick stayed involved every step of the way from the precise wiring configuration to the logo and printing on the pickup including his renowned number seven imprinted right on the side of the casing. Seymour Duncan blackouts EMTY come in both neck and bridge and are available in black plastic or black nickel covers. Pickups come with all necessary mounting hardware, including pots, jack, and a battery clip.